Dubai, UAE, March 18, 2019: Following the success of its expedition in Africa, TOYOTA’s GAZOO Racing arrived in the UAE for the final stage of its 5 Continents Drive project in Asia, which started in the Middle East. As part of the itinerary, the team had stopovers in Abu Dhabi, Dubai, Khorfakkan, Fujairah, Sharjah and Ras Al Khaimah. 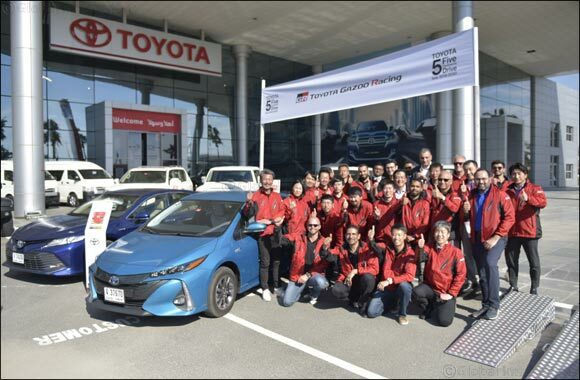 The 5 Continents Drive was introduced to help everyone at Toyota to develop vehicles that excite the company’s customers and exceed their expectations. The seven-year project of unparalleled scale that has the power to unite all of Toyota’s 370,000 members around the world, has now covered four of the world's continents, since its launch in 2014. Throughout the drive, around eight members consisting of Toyota’s employees and Al-Futtaim Toyota covered a distance of around 900 kilometers across the UAE. The team’s itinerary included driving across the country’s diverse and wide-ranging roads while experiencing first-hand the harsh conditions in which vehicles are used daily by Toyota’s customers. “Roads train people and people make cars”; that ethos has been the backbone of the 5 Continents Drive project. It is about enabling employees to get out from behind their work desks to feel the road, to experience first-hand how vehicle performance is impacted by the wide variety of driving conditions around the world and to gather new insights. By connecting with customers in a meaningful way and listening to their feedback, Toyota can better understand their needs and usage patterns. “We are thrilled that the 5 Continents Drive embarked on a journey of discovery in the UAE,” commented Saud Abbasi, Managing Director at Al-Futtaim Toyota. “By experiencing the unique culture, climate and harsh conditions in which Toyota’s vehicles are used, the drive enabled team members to gather insights into the value of Quality, Durability, and Reliability (QDR), which Toyota’s vehicles are famous for and elevate it to the next level. Our customers have remained an abundant source of inspiration for our pursuit of creating better, cleaner and safer vehicles and we cannot thank them enough for their continued support,” added Mr. Abbasi. The long-term continuous human resources development project commenced in Australia in 2014, then moved to North America in 2015, Latin America in 2016, Europe in 2017, and Africa in 2018. Since the project started, 556 members from inside and outside Japan have covered a total of 99,600 kilometers over a period of 399 days. The project sees the Olympic and Paralympic Games Tokyo 2020 as a milestone and will endeavor to continue its activities until this major event takes place. From the Arabian Desert to the frozen polar wastes, Toyota’s vehicles proved themselves as trusted top performers, whatever the environment. Now it has gone further in its world-conquering achievements by claiming Toyota’s first victory in the 41st edition of the gruelling Dakar Rally. GAZOO Racing South Africa’s modified Hilux led throughout ten days and more than 3,000 miles (4,828 kilometres) of harsh desert driving in Peru to claim the win in the car category. Even though the pick-up was specially adapted to deal with the challenge – including a mid-mounted V8 engine – its success is another demonstration of the reliable and hard-wearing quality of the engineering that has defined Hilux for decades. Our customers who use the Hilux for their day-to-day business will enjoy a versatile pick-up with built-in ruggedness that combines the essence of Toyota’s learnings from tough motorsports events with high levels of safety and comfort, making it a robust all-rounder. The challenges faced by the GAZOO Racing South Africa Hilux on the Dakar were exceptional, but Nasser Al Attiyah and co-driver Mathieu Baumel successfully negotiated the ten stages to seal a historic first victory for Toyota in one of the world’s toughest motorsports events. Their triumph adds to the recent impressive successes Toyota has clinched in international competitions, such as the Le Mans 24 Hours and the manufacturers’ title in the FIA World Rally Championship. Since 2012, the team had posted five podium places and seven top-five finishes, whereas Al Attiyah’s win comes after a second-place result in 2018. The Hilux was also the first petrol vehicle in its class to take victory since the start of the Dakar’s South American era, being powered by a mid-mounted, normally aspirated V8. There was further success for Toyota in the event with the Team Land Cruiser Auto Body (TLC)’s #350, driven by Christian Lavieille and Jean-Pierre Garcin, winning the Dakar Production Division category for the sixth consecutive year. Meanwhile, #349, driven by Akira Miura and Laurent Lichtleuchter, secured second place in the category. Over the years, Toyota has been participating in many different forms of motorsports, ‎including Formula One, the World Endurance Championship (WEC), and the Nürburgring 24 ‎Hours endurance race. Toyota’s participation in these events was overseen by separate ‎entities within the company until April 2015, when Toyota established GAZOO Racing (GR), ‎to consolidate all of its motorsport’s activities under one in-house brand. Representing ‎Toyota’s belief that ‘the roads build the people, and the people build the cars,’ GR highlights the role of motorsports as a fundamental pillar of Toyota’s commitment to ‎making ‘ever-better’ cars. Harnessing years of experience gained under the extreme ‎conditions of various motorsports events, GR aims to forge new ‎technologies and solutions that bring the freedom, adventure, and joy of driving to everyone.